Great Cookbooks – Where are they? Ever the cookbook fiend, I just can’t help noticing that there aren’t many great cookbooks out there right now with the ‘Wow’ factor. What’s happened to them all? Even though our new house is quite petite compared to the last one, we have a front room dedicated mainly to all our cookbooks. Looking at the newish cookbooks out in the last year, I’ve not been tempted by (hardly) any of them, except Tom Kerridge’s, just because he comes over so much fun and full of knowledge on the TV. Before I go any further, I’ve just found out that Face Publications has a special offer on it’s first three cookbooks. Now, these are Great Cookbooks. It’s a very good offer, and makes these award-winning cookbooks incredible value. from the Gourmand World Cookbook Awards in Paris. To be honest, this book is not only a superb cookbook, it is a work of modern art. Brilliantly designed, an amazing story with stunning and charismatic photographs and, not forgetting what it’s meant to be about, fantastic food recipes from that modern day maestro of the Michelin star (or stars in his case), Sat Bains. Sat Bains holds 2 Michelin stars, and is based in Nottingham at Restaurant Sat Bains. His tasting menu will go down in the annals of the culinary world as one impossible to equal, both in taste and his imaginative use of both foraged and farmed foods. Sat’s book is not only superb, it is big. Very big. And is very different. In look, in content, in use of paper. I suppose the word is innovative, and like no other cookbook I’ve seen (and believe me, I’ve seen a lot). It’s a book that not only attacks the senses with colour and design, but also attacks the mind, when you read Sat’s philosophy on the use of food. I was incredibly lucky to have been given this as a present, and it, along with Anthony’s other three books, has a very special place in our Lounge (and our hearts). 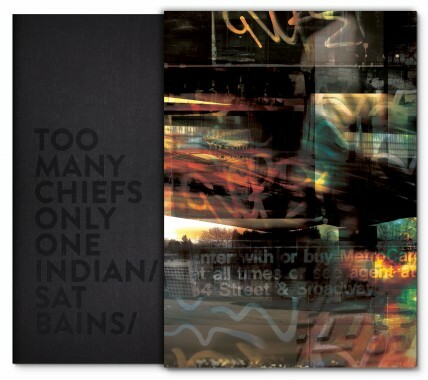 Now, if “Two Many Chiefs Only One Indian” only came out last year, where are the other stunning cookbooks? Son Anthony is busy getting on with the other important aspects of his Design business, and will only consider designing another book if he feels that both he and the writer will complement each other, and will work well together. So where are the fabulous new cookbooks this year? Can anyone point me in the right direction? We all have our ancient, corner-scrunched, batter-stained cookbooks, which contain our old favourite, basic day to day recipes. But, if like me, you are an absolute cookbook addict, don’t we just actively need one or two books a year that make us quake with expectation when we first hold them in our hands, and, when opening them up, on our eyes first falling on a stunning photographic depiction of a succulent, mouthwatering platter of food, there is a warm sigh of almost orgasmic pleasure. Go on, admit it cookbook addicts! So come on you young and old Designers – don’t be afraid of those Michelin star chefs – stand your ground and demand the chance to create a work of art for the culinary world. Us followers deserve more! And if you want to see how it’s done, take a good look at Anthony Hodgson’s website for Face Publications. There you can see four very different cookbooks, each one tailored individually for their respective chef/writer. Take a ‘look inside’ each book, and notice the different graphics, the superb photographs and above all, beware – your mouth will start to water when you look at the incredible recipes. All designed by Anthony, all published by Anthony so that he could have total control of content and design, and all four have achieved the accolade of “Winner”, not just from the ultra-prestigious Gourmand Cookbook Awards and Gourmand World cookbook awards, but the books have also won a myriad of awards worldwide in the design and print worlds. 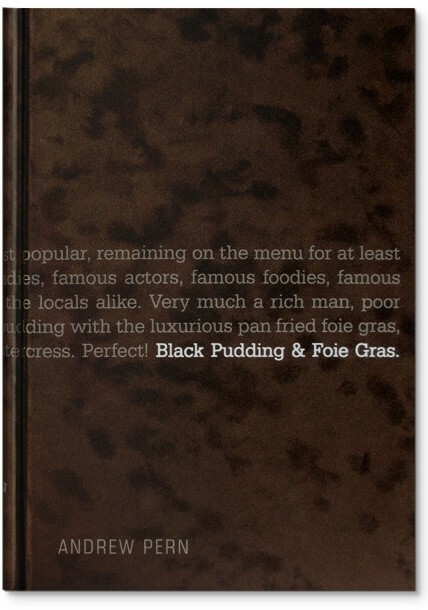 Black Pudding & Foie Gras was the first book designed and published by Face Publications. Written by Andrew Pern, chef/patron of The Star Inn, at Harome, North Yorkshire, and, surprisingly for a chef, Andrew has proved himself a very accomplished writer. The Star Inn and Andrew had won a Michelin star 9 years in a row, and will no doubt soon win one again. Andrew Pern has recently opened The Star in The City, within the ancient walls of the City of York. An incredible setting, and brilliant food all day long. Well worth a visit. This book, Black Pudding & Foie Gras, has a special place in my heart. When the seed of an idea was planted between Anthony and Andrew Pern, to create a beautiful cookbook that was stunning and different in every way to any other cookbook, Anthony asked me to help, to research the ways of selling such a book, the best bookshops in the world that we thought would be interested, and during this research I chanced upon awards for cookbooks, such as the world-wide Gourmand awards. I remember Anthony was in Verona, overseeing the printing of this book above, and I downloaded the entry form for the Gourmand awards and sent it to him, wandering if it was of any use! Who would have thought it would lead him to world-wide accolades for all four cookbooks. So I was heavily involved at the beginning. Let’s face it, to a cookbook addict like me, researching any thing to do with my passion is not classed as work – it’s just a dream job come true! But back to Black Pudding & Foie Gras. It isn’t just a cookbook. This award-winning book is a brilliant read, a moving story. Andrew writes about his childhood, growing up on an old farm not far from Whitby, North Yorkshire. Food influences filtered into him from his Grandpa, from watching wild deer in the woods and catching fish in the sea and rivers – it is a heartwarming story. We are taken behind the scenes at The Star Inn, and meet the local producers of the fantastic products favoured by the chef. Black Pudding & Foie Gras is, simply, a book for everyone, foodie or non-foodie.With it’s soft, rich brown cover (very strokeable), it’s mouthwatering recipes and stunning photography, and Andrew generously sharing with us his signature dishes plus the secrets of his basic recipes, it’s very special. One of my all-time favourites. 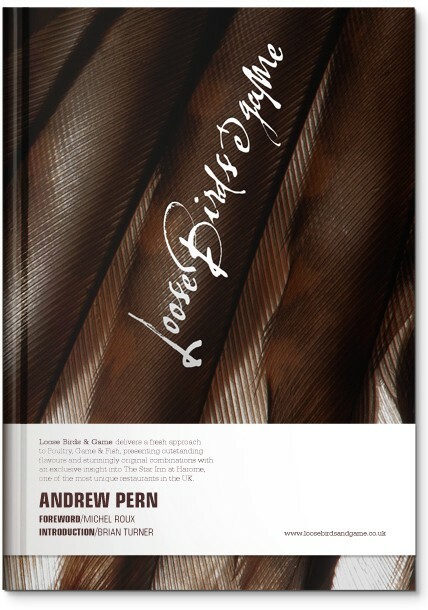 Loose Birds & Game, Andrew Pern’s second award-winning cookbook, has a forward by Michel Roux and an introduction by Brian Turner. This amazing book changed my own ideas of Game considerably. No blood and guts in this book, but a beautiful book that explains the importance of Game in all it’s forms, and why both for us and the farmer we should consider eating much more of it. It has inspired me to be more adventurous in using the huge variety of game (and Loose Birds) that abound in and around East Yorkshire. All of Andrew’s recipes in this book look so incredibly delicious on a plate, and his use of edible flowers and his presentation makes food look like a work of art. We can all learn how to make our food more appealing, but somehow I know I will never quite achieve Andrew’s level. From it’s padded silk cover, representing feathers, through to Andrew’s inspirational philosophy on why it is important to use what nature has gifted us in the way of food, Loose Birds and Game is overflowing with Andrew’s enthusiasm for cooking with fish, poultry and game, and it not surprising that it won both the Winner ‘Best UK Single Subject Book’ and also the Winner ‘World’s Best Single Subject Book Silver Award from the Gourmand World Cookbook Awards. 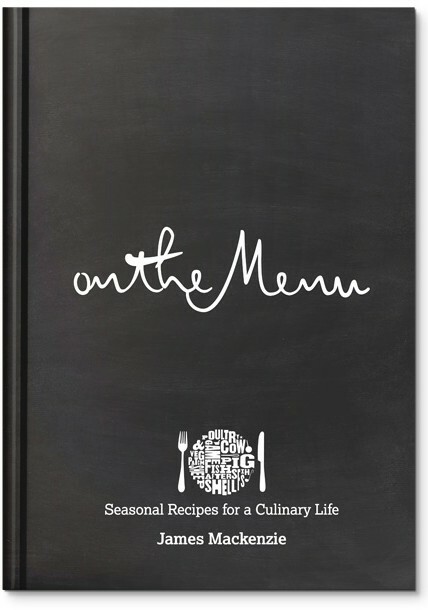 On The Menu is a fantastic first cookbook from Michelin-starred chef James Mackenzie. James used to be Andrew Pern’s right-hand man at The Star Inn at Harome (what a small world is the culinary one!) Having left Harome, James and his wife, Kate, took over one of the most desirable and stunning ancient pubs with a restaurant in East Yorkshire. The Pipe and Glass, at South Dalton, is a few miles north of the beautiful market town of Beverley. The Pipe and Glass is a picture postcard type of old-world pub, but there is nothing old-world about the restaurant, overlooking beautiful parkland. With the addition of superb bedroom suites, this is another very special place to eat exquisite Michelin-star food, whether it be in the timbered old bar and side rooms or in the beautiful restaurant area, and if you want to stay the night, believe me, the luxury of the bedroom suites plus a Michelin-star Yorkshire breakfast will mean you will never want to leave. And that’s what he got! A very different book to the first two from Face Publications. For a start the cover has a soft-black feel, imposed with the sharp white script. Sort of fun, but business like as well. And wipe-clean! When Anthony first sent me some pages he had been playing about with, I absolutely loved them. He had designed swirly sheep, and black and white splodgy cows. Have a look inside James’ book on the Face Publication page and you will see what I mean. That is the fun side of the book. But on the serious side, James gives us step by step instructions for his great recipes, and the photography, again, is stunning. Some of James’ signature dishes are included, so if you’ve been lucky enough to eat the amazing food at The Pipe and Glass, you have a chance to attempt to replicate the dish at home. It is a fabulous book to get you to be more adventurous and will help you advance your own culinary skills. Again, the quality of Face Publication’s design and James Mackenzie’s writing and culinary skills were recognised in the Gourmand World Cookbook Awards for Winner ‘Best First Cookbook’. So no mean feat by Anthony Hodgson of Face Publications, working alongside Andrew Pern, James Mackenzie and Sat Bains to produce cookbooks that have won world-wide accolades. Over the last four to five years they have given us such stunning, imaginative and superb cookbooks. Where are the next ones coming from? Someone please tell me. I’m desperate! Don’t forget the special offer from Face Publications. Click Here. Food, Furniture and …… First Chemo Sesh!